The piano (Italian pronunciation: [ˈpjaːno]; an abbreviation of pianoforte [pjanoˈfɔrte]) is a musical instrument played using a keyboard, which is a row of keys that the performer presses down with the fingers and thumb. Invented in about 1700 (the exact date is uncertain), the piano is widely employed in classical, jazz, traditional and popular music for solo and ensemble performances, accompaniment, and for composing and rehearsal. 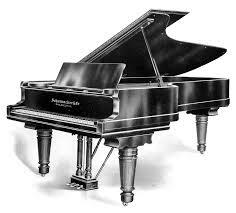 Although the piano is not portable and often expensive, its versatility, wide range, ability to change dynamics, the large number of musicians trained in playing it and its ubiquity in performance venues and rehearsal spaces have made it one of the Western world’s most familiar musical instruments.